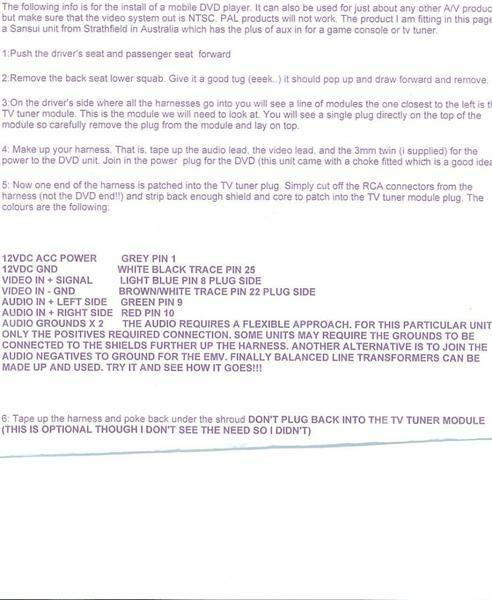 I know this type of thread has been covered before but from my searching all I can find is either "it's easy to do", instructions referring to a cable I don't have, or instructions that would take me a whole weekend to do with great risk of damage. Missing pictures and broken links aren't helpful either but I guess that happens when searching 14 year old threads. All I really want is just a way to have RCA audio input, if I can get video as well then great but it's less of a priority. From that point I can easily continue. From what I've found, this means the TV tuner is outside of the EMV rather than built in. 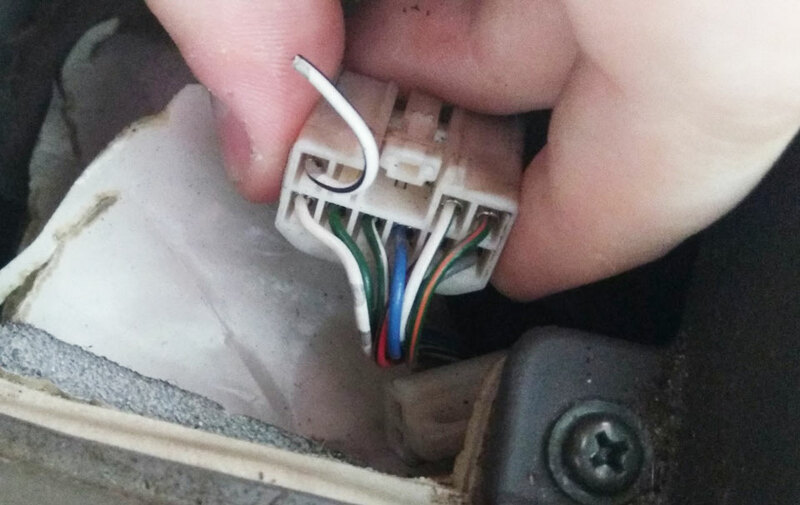 A 10 pin plug, with 1 missing, and 1 cut, and colours that don't match any wiring diagram that I've come across. This might caused by the engineer who did the auto->manual conversion, or I may just be mistaken with what should be there. If I have to tap in to the TV tuner from the rear of the car that's ok as I will be putting in a wireless unit, so location is irrelevant. Unfortunately all the info I found about creating inputs from the rear are very involved and often require PCB soldering which I'm not entirely comfortable with. Any help with this would be greatly appreciated, or even if there's someone in the Brisbane area willing to set it up for me I'll gladly throw a case of beer their way. I did what you intend to do a couple of years ago with the help of Tom Richards. You do not have to remove the EMV. Most of the gear is under the back seat. You will have to buy an adapter unit (from Ebay) that will send Audio, video and reverse camera input to your EMV. If I remember correctly that adapter unit cost less than a $100 including postage. There is some soldering involved. There is a comprehensive tutorial in this forum. It will also show you how to disconnect the "safety" feature which switches off the video display once you put the car in gear. The adapter unit has a remote function. Some people install the unit in the glovebox. I installed mine under the dash. It will read MP3 audio and video from a USB thumb drive. If you only want audio input you can buy a adapter that use the tape player into a RCA input. The sound quality is not crash hot but it is satisfactory. I will dig around and see if I still have that gadget lying around. Tapping into the tuner outputs to the audio receiver is the way to go. Mike I'm assuming you mean like this guide? If using the plug mentioned here under the back seat I can make up RCAs to connect NTSC video + audio then fantastic. I'm just a bit cautious at the moment because every photo I've ever seen of the TV tuner is from someone opening it up and soldering inside, where all I want to do is bypass it. But if this works I can then wire up a chromecast (or similar) + HDMI -> NTSC converter, and can wirelessly mirror my phone into the EMV. All for around $80! Vincent, thanks for the info but I haven't been able to find any adaptors on ebay. As long as I have the wire location and colours sorted though I can make one up. Yes it was the red and green audio feeds. Never seen that guide before, I referred to an EMV wiring diagram to work out what to do for my car. I'll start by saying I'm an idiot for not checking earlier, but when I pulled up the back seat and found the TV tuner module there was already a hole in the casing with cables coming out, terminated at RCA plugs. So I immediately felt pretty dumb. After some playing around I got a bluetooth receiver, adapted from 3.5 -> RCA into it and found that it was set up for channel 19 on the TV. Current plan for tomorrow is to crack open the bluetooth unit and one of those lighter socket 12V -> 5V USB things.. and hardwire it into the car. Once that is done it will power on with the car, receive audio from my phone, and power off with the car. Chromecast is a little more complicated as it needs a wifi network for casting, so that can wait for a later date. Thank you to whoever it was, multiple owners ago who did the hard work for me. The rest is easy. Have you thought about a raspberry pi running android auto rather than a chromecast and video converter? They have composite video out already built in. The only downside is start up time and no ability to control the phone as it's meant to done via the car screen. But you could probably mirror you phone to the pi like the chromecast somehow also. Not long after I started playing music through a bluetooth receiver into the TV Tuner, the EMV screen went black, made a fizzle noise and filled the cabin with a light mist of smoke and burnt electronics smell. It came from the EMV itself which I haven't even touched. No picture, no response from touch, no beeps from buttons and no more beep when entering reverse. Can't even change aircon temp and fan speed anymore. I haven't the slightest clue about fixing these things or how to diagnose it so if there's anyone in Brisbane who can check it out for me I'd appreciate it. 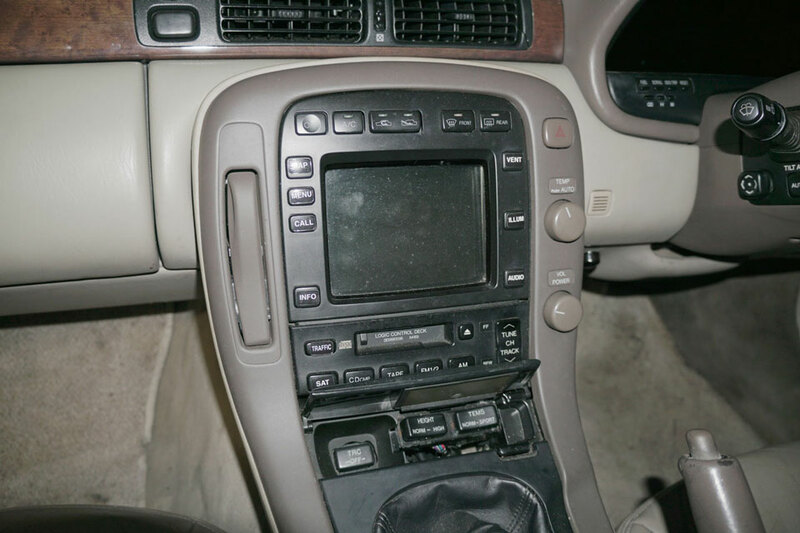 If it's not an easy fix though I may just go the route of replacing it with TT aircon controls and a double din android unit, then sell off the EMV/TV/Tape/CD Stacker to anyone who wants it. Everything was working until the EMV going dark. As before, beer is on offer again to someone who can fix or get/make me a patch loom to upgrade. I don't understand how but it sounds like you have fried the EMV. Replacing the air con controls with a TT unit is complicated. You have to redo the wiring loom. The air con control will still work without the EMV. The basic functions like turning it on and off, temperature control, and to some degree the fan speed. The auto temp control button under the hazard light switch will still work without the EMV. Yeah I don't understand it either. I've owned the car barely a month and all I did was plug in a bluetooth receiver to existing RCA cables under the rear seat. FM radio was working fine for several weeks, but I do this and BAM, no EMV. True about air con too, I haven't tried the auto function yet but the buttons above the EMV still work as normal. The buttons on top of the EMV will work. It is a completely different unit and not connected to the EMV. The EMV is getting too old and expensive to repair and the resolution is rather poor compared to today's screens. I replaced mine with a new ICE unit. what about replacing it with another EMV? It could also just be that a capacitor died and took out the power supply.. There are people around who can try and fix them. Not sure if they are on here of FB..